Learning to swim seemed very important to me at the age of 10 years old. One day I walked to Brushy Creek on the adjoining Maddox farm about a quarter mile from our house. There I found a 15 foot wide circle of water in the creek where the depth was about 3 to 4 feet. I tried pushing up with my feet as I pulled forward with my hands in a dog paddle fashion and found I could go a few feet on top of the water before my feet were allowed to touch the bottom. After several tries I gained confidence and was soon staying afloat for the full 20 feet of distance between the banks of the creek. In less than an hour I had mastered swimming. From that day forward, I swam with the big boys in the creeks and rivers the rest of that summer. Excelsior Springs was a modern, small tourist city famous for mineral springs. The Elms Hotel was an attraction for the rich and famous to visit the mineral baths, spas and medical treatments provided them. President Harry S. Truman and his wife Bess frequently visited the city for the mineral baths. The City had many mineral water facilities but also had several medical hospitals which specialized in ailments common to middle Americans. Excelsior Springs was often referred to as the "Cottontail City" because of the excellent hemorrhoid clinics that operated there. My favorite place in Excelsior Springs was the Hall of Waters. 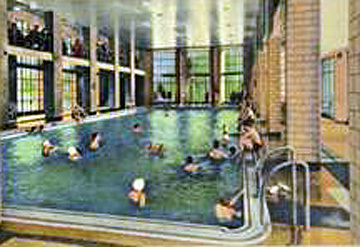 Every time we visited Excelsior I would go to the Hall of Waters, pay my quarter, and swim in the beautiful indoor swimming pool of mineral water for an hour or so. I usually became bored with the swimming part and would try the 10 foot high diving board. Once I had tried the high dives there was no return to just swimming. If seeing a diver perform a special dive, I would practice duplicating it until I had mastered the maneuver to my satisfaction. I would practice dives for hours until forced to leave by my parents or whoever brought me to Excelsior. As the years went by, I used the indoor pool countless times each year. When I was attending Excelsior Springs high school as a freshmen, I spent every opportunity at the Hall of Waters. A favorite dive for me was a reverse Pike dive which divers normally referred to as a "gainer." The diver faces toward the pool but on springing from the diving board, the diver throws the head back towards the board and rotates in a reverse of a forward dive. The ceiling on the Hall of Waters pool was close enough to touch if the diver really tried to do so. It was my last time at the Hall of Waters at the age of 14. I was showing off my repertoire of dives for the visitors and swimmers. I was the only person using the 3 meter board and I was executing one dive after another in rapid succession. I started the gainer dive sequence with the reverse pike dive which was a one half gainer where the diver bounces his feet out away from the board and up at the ceiling, touches his hands to his feet and falls the upper body back down outward of the diving board and toward the water below. My dive was completed as I became absolutely vertical coming down at about diving board height when I saw a young boy had jumped out from pool edge into the pool and was directly where my head would enter the water. Recognizing the dangerous situation, I immediately snapped my head down and tried to somersault into a feet first entry. There was not enough distance to complete the tuck rotation and my left hip hit the top of the boy's head. I felt a sharp pain in my lower back on impact and felt the boy below me in water. Reaching down with my right hand, I pulled him up to the surface and struggled with him over to the pool edge where I pushed and rolled him face down on the tile. The Lifeguard immediately went to work on the young boy. Climbing out of the pool was impossible since my left leg would not respond to my actions and it was extremely painful. I made my way toward the shallow end of the pool and dragged myself up the steps and hopped along the wall and into the dressing room. Knowing I was in deep trouble, I changed into my street clothes. The Lifeguard came in and told me the boy regained consciousness and appeared to be all right. And, that the boy's mother was with him at that time. I told him that my leg was out of joint and I needed a chiropractor. He called a taxi for me and gave me the address to the chiropractor's office. The taxi driver quickly had me to the doctor who happened to be a woman. She helped me onto the patient table and told me the leg was out of the hip socket. In a matter of five to ten minutes she pushed and tugged until she had the leg back in seemingly perfect condition. After expressing my grateful thanks I walked out of her office without help. My age was 51 when I finally quit 3 meter diving. I experienced other problems over the years, such as making head contact with the diving boards which sometimes had sharp aluminum edges, but I never landed on anyone again. The next year I attended Redlands High School in California. When my Uncle Clinton and I returned to northwest Missouri in 1951 we could not drive into downtown Excelsior Springs because it was dozens of feet underwater. A torrential rainstorm had flooded the city beyond restoration for most of the tourist attractions and businesses. 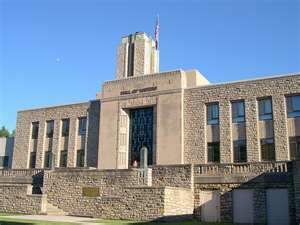 The indestructible Hall of Waters building became the City Hall.